This wall mirror's unique shape comes from its cut-corner design. A modern take on a traditional square design, this frameless mirror gets its unique shape from its four cut-out corners. The beveled edge adds a subtle decorative finish. This beautiful mirror is a wonderful way to open up a room and provide a decorative accent for an empty wall. Hang weight is 20 lbs. 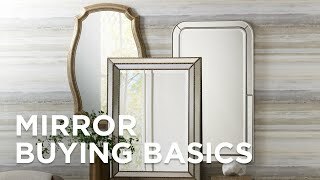 Can this mirror be hung on bathroom tile? BEST ANSWER: Yes, but it is a special installation that requires custom work to be done to the tile. Add a touch of regality to your walls with this lovely crowned mirror design. Cameo Flush Mount 19 1/2" x 26 1/2"
Add this small frameless oval flush mount wall mirror to an entrywaybedroomor living space. Cameo Flush Mount 23 1/2" x 31 1/2"
Exceptionally brilliant and tastefulthis large frameless rectangular flush mount wall mirror brings a classic touch. Add a touch of regal sophistication to your walls with this double-crowned mirror.